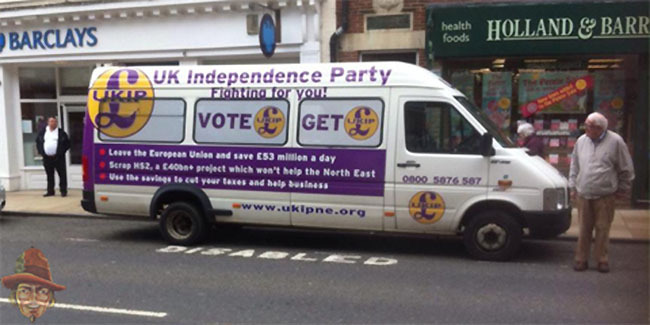 TheBlueGuerilla: UKIP's 'The Finch' Strikes Again. UKIP South East Candidate and Farage P.A. Raymond Finch is back up to his usual tricks, TBG can reveal. As panic set in last night for the UKIP Campaign Team amidst a triple whammy of poor opinion polls, it's emerged that hot on the heels of "The Finch" only attending a hand full of council meetings in the last six months, instead of campaigning in his South East region yesterday, he was over 400 miles away in Northumberland. And just to put into perspective the delusion of "The Finch" he was even quoted on Twitter defending the decision by their campaign bus driver to park in a disabled parking parking bay. Maybe he took lessons from either Councillor's Mike Hancock or Michael Andrews. Then again, at least they didn't crash it like they did in Portsmouth. There's a rumour going round tonight that Finch and Farage had a crisis meeting in the last 24 hours... In a pub. Which is probably the soundest news to come out of UKIP in the past 365 days.